Did you know that National Closet Clean Out Week begins the third Sunday of March? 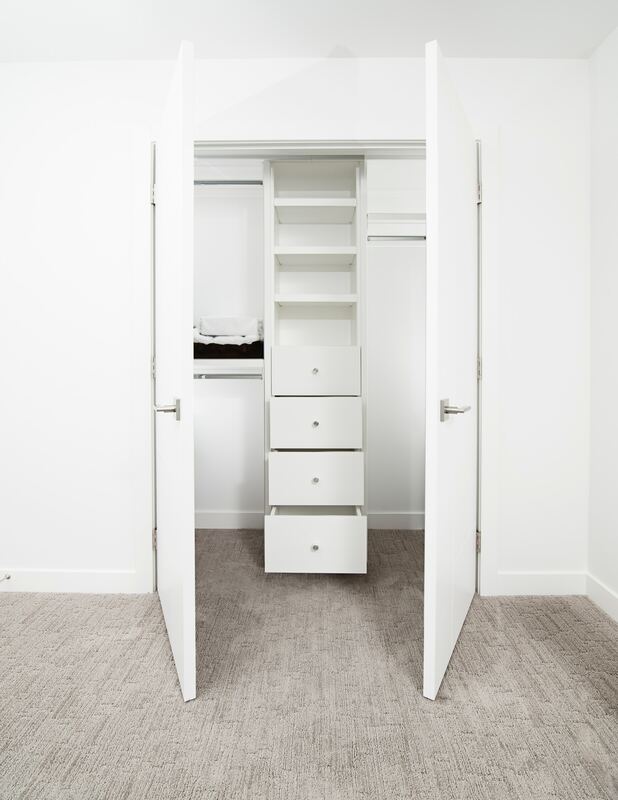 It is always a great time to clean out your closet, so don’t wait to give yourself the joy of a tidy closet and a tidy home. Let’s jump into Closet Cleanout Week and get started now! Here are my top five tips for tidying up your space with the KonMari Method™. Do you want to relax in the evening by candlelight with fresh flowers on the table while listening to music, or watching your favorite TV show? Do you dream of the aroma and taste of home-cooked meals? Perhaps you want to deepen your friendships, or even start new relationships? Think about the people and things that bring you the most joy. 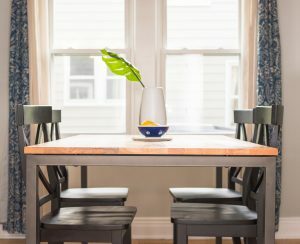 Before you begin tidying, it’s important to clearly visualize the end goal, and write down or select a picture of how you want to live once your home is tidy, so you can refer to it throughout the process. You might even want to hang it on the wall or frame it so that you can have a daily reminder of your end goal, the light at the end of the path! #2 Gather Everything in One Place – In the KonMari Method™, it is imperative that you gather every single item in the category or subcategory in one place in preparation of the discard process. Don’t leave anything out! For example, when you tidy clothes, bringing everything into one place means making sure your laundry is done before you begin and that you have fetched any odd clothes like coats or formal dresses stored in other areas of your home. It is very important to lay your eyes on the full volume of your possessions. This will also give you an idea of the amount of each item you have in the house. I’ve seen people with large collections of household items like pens, pencils, shoes, toys, and even spatulas – and they didn’t realize it. While individual spatulas may “spark joy,” most non-chefs will admit that they don’t actually need – or want – 10 of them. #3 Practical Items Spark Joy, Too! – Thank you, Marie Kondo, for giving us the simple question to use while tidying: “Does it spark joy?” This ingenious metric catalyzes the process of decision-making while tidying! 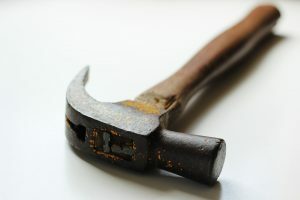 I often get questions about items that are practical but don’t seem to spark joy on the surface, such as, can a hammer really spark joy? Absolutely! A hammer is there for you when you need it. #4 Discard Items with Gratitude – Letting go with gratitude is one of the hallmarks of the KonMari Method™. It might feel uncomfortable or awkward to say a few parting words to your things, but give it a try. 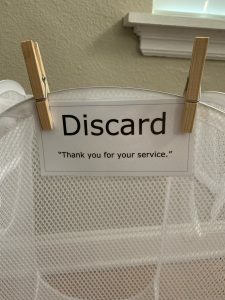 Thanking our discarded items for their service helps us let go of any guilt we feel about having held on to something that doesn’t spark joy and lets us be more mindful about the items we allow into our life in the first place. Gratitude also increases our joy. Show gratitude not only for the items you are releasing, but also for the items that you are keeping. Always be thankful for what you have. 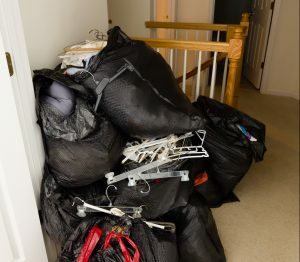 #5 Remove Items That Don’t Spark Joy Right Away – I suggest donating, re-selling, or discarding items that don’t spark joy as soon as possible after tidying up. They will continue to weigh you down until you have released them, and you will feel great relief when you let them go. 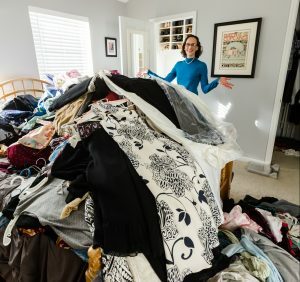 When I KonMari’d my home, I still felt burdened until that donation truck arrived or that buyer showed up at my door. Re-selling an item can be a beautiful opportunity for gratitude for both the giver and the receiver, as buyers are always so grateful to receive something useful to them. If you do end up with any items that you would like to re-sell, take a photo and post it immediately. National Closet Clean Out week starts now. Let’s get tidying!